Just like other snowboard equipment, snowboard boots can also vary in many different ways, and can have many different properties. Although not all of them will make a difference to your snowboarding, they can make them easier to put on, and more comfortable to wear, so they are worth knowing about. There are 2 types of snowboard boot, soft boots and hard boots. This section is about soft boots as they are by far the most common, hard boots are only used on alpine/racing snowboards with plate bindings. There is more than one type of soft boot though, whereas most soft boots are not binding specific, like the boots shown on this page, to use step-in bindings special boots are needed. Unlike ski boots, snowboard boots (soft boots) are not made of plastic, but of less solid composites, fabrics and materials like leather. This is because a lot more flex is needed in a snowboard boot. Although part of a snowboard boots job is to protect the ankle, it still has to allow a good amount of movement in the ankle, both forwards and side to side. Although ski boots do move in these directions, it is nowhere near as much. The biggest difference between different snowboard boots, that is easily noticed are the different lacing systems that they can use. Some boots tie up like normal shoes, but most boots these days have a system where the laces are pulled tight and tied off by wedging the laces in special slots around the boot. There are many different types of these systems, with each manufacturer generally having one or more different methods. Boots with cables for laces are also becoming more common, they have a dial that is twisted to tighten up the boots, and then pulled out to quickly let the boots undo. All of the systems have their advantages and disadvantages, some might be very quick to do up, but not have much adjustment for how tight each part of the boot is, and others slower to do up but with far more adjustment. You have to decide which system suits your needs the best, and then try and find a suitable boot that uses it. Another thing to look at in boots are the liners, as these can also vary. The liner is the softer inside part of the boot, that cushions the foot. It is important that the liner is close fitting to the foot, so that the foot cannot move inside the boot. Most liners that come with boots today will mold to your feet when heated, this helps them to fit as well as possible, but it cannot perform miracles, the boots need to be as snug fitting as possible to start with. Heat molding is not the only trick that liners have though, some have gel in places like the back of the ankle to stop the heel being able to lift in the boot, and slidier areas to make them easier to put on. Most liners are removable, but some are built into the boot so that the boots length can be shorter, and cannot be removed. 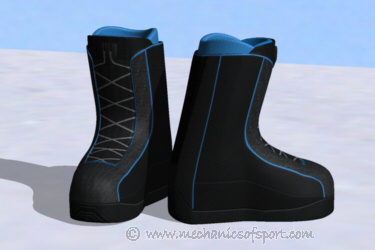 Similarly to snowboards, snowboard boots can be more flexible or stiffer. The same rules apply here, a stiffer snowboard boot will be more responsive, and handle better at higher speeds, but it will also be less forgiving, and can be less comfortable. A softer more flexible boot will be more forgiving, more comfortable and allow you more movement, but it won't be as responsive or as good at higher speeds. Again often freestylers go for softer boots, and freeriders for stiffer boots, but this can change a lot depending on someone's riding style, some of the best freestyle boots actually have quite a stiff flex. 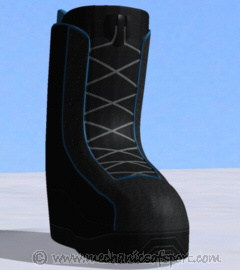 Snowboard boots should have a very snug fit, so that the foot cannot move inside it much. When you stand straight you should be able to feel your toes pushing lightly on the ends of the boots, but when you lean forwards onto your shins you should feel that pressure come away. 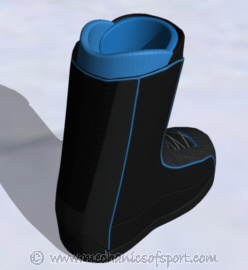 It is very important to make sure a snowboard boot is tight fitting and comfortable, if your foot is able to move within the boot it can cause all sorts of problems. One of the most common problems is heel lift, where the heel is able to lift up inside the boot, when trying on boots you should look for a boot that holds your heel in place well. If you can only lift your heel slightly in the boot you might find that if once your foot is strapped into the binding the heel lift stops. On to the Stomp Pads section.